Mike Grissom passed his Private Pilot check ride on January 15th 2014. He flew a Cessna 172, N8432U, with Designated Pilot Examiner (DPE) Henry Joyner at the Tri-county airport in Ahoskie. Mike is an RC model aircraft enthusiast who thought it would be great fun to fly an airplane from inside the cockpit instead of remote control. Empire Aviation would like to recognize the work of CFII John Zadrozny who was Mike’s initial instructor. 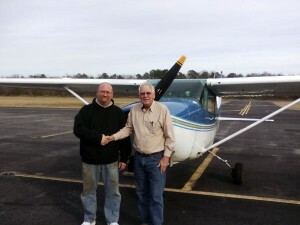 Mike completed his first solo flight under John Z’s tutelage.